Drug fixing, poison making, artistic skills, assassination skills, brawling skills. 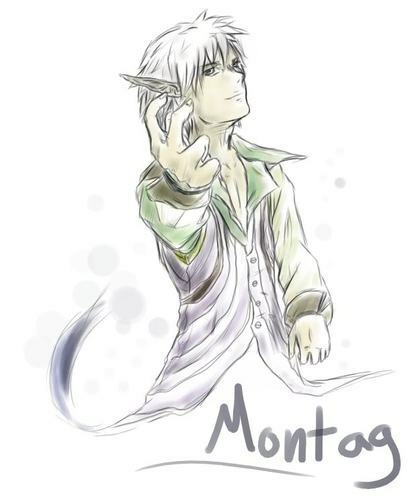 Montag can be described to have a young gentleman appearance. His posture is near prefect, and his body shows no flaws. It was as if he was raised as a noble. He has snow white hair, that always seems to be kept free of any dirt or grime. He wears the finest tunic and breeches. Rarely would he wear such things that the commoners would wear. He always seems to be smiling, less that smile be sincere, sinister, or down right creepy. His face is always clear of any whiskers or shadow. He has the body of your average male, with little to no fat on his body. When one meets Montag for the first time, he is very kind, gentle, loving. He seems to try to do everything right to this person. He complements them. "Oh how lovely is your hair~ My it is as if the Gods themselves hand weaved it!" He flatters them, and tries to get on their good side. Then when one least expects it he turns. "My, my~ Such supple skin. Mind if I take a sample?" Or most of the time he would just lay off his torturing and harmful attacks as just simple misunderstandings. "Oh deary me~ I didn't know you were allergic to acid! Oh my, just look how your skin is falling off. We should get that looked at, yes we should~"
He can also be deadly serious when the time can arise. His face will never lose its smile though. All in all, Montag is a creepy, blood lusting, murderous lover boy who just wants to make the perfect art work. "My, my~ Look at you! Yes with a few alterations you could become my greatest piece of work ever!" In the past, Montag was brought up in a lowly third grade home. They barely had enough to feed him, let alone his four other brothers and sister. It was then Montag found a way to get more food for the family. Simply just take care of the competition! First he started with his older brother, the strongest. It was simple really, just lure the dumb lug to the lake and drown him. The second would be his twin sister, the love of the family. She had so much attention brought to her, that she didn't notice the makeup Montag had bought her was actually a very deadly skin poison. The other two children, his two younger brothers, were the easiest yet. "Here~" he said one day, "These are very good to eat, yes pop it in your mouth just like that! I heard these little toy blocks are the best candy in the city!" Soon enough Montag was the only child left in his family, and although his mother and father wept, Montag never felt guilty. For the next eleven years he ate like a king! That is, before he offed his parents as well to gain what fortune they had left. With money in hand, and a murderous intent seeded so many years ago, he was off. To this day Montag kills and posts the bodies of his victims on the city streets. Some would stare in disgust, but others who appreciate this mans weird sort of work stare in awe. Artwork done by my friend Sammie.